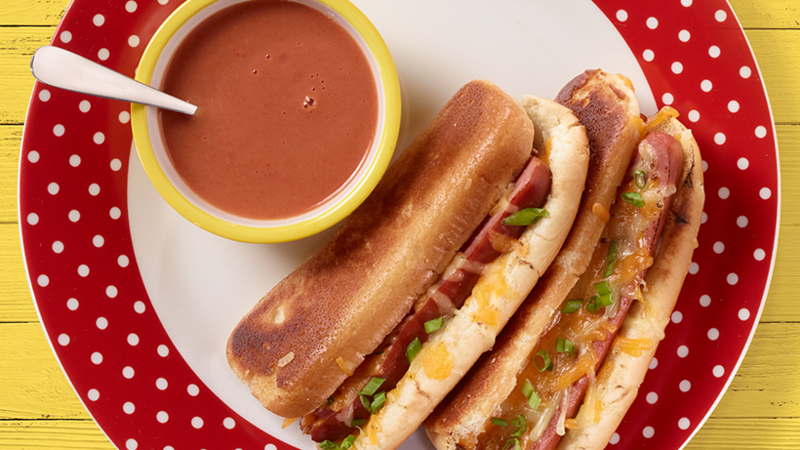 Our Grilled Cheese Dogs combine your two favorite flavors into handheld magic. Try ‘em out. Open and roll each hot dog bun flat with a rolling pin. Spread the outside of each bun with 1 tablespoon butter. Place it on the skillet, butter side down, and sprinkle top evenly with 1 cup shredded cheese. Slice each Gwaltney Great Dog lengthwise to where it’s still connected, but will lay flat on the grill. Place hot dog, flat side down, on the grill next to the bun. Grill for 2 minutes on the flat side or until it starts to brown and then flip over and let grill for another minute on the other side. Transfer the hot dog to one side of the bun and sprinkle it with 3 tablespoons shredded cheese. Close bun over hot dog and let grill until cheese is completely melted. Serve with ketchup and mustard.